Two Trumpets Will Blow...Will You Hear Them? it had its FOUNDATION on the ROCK. Have you been in a long, hard, grueling season? Are you feeling beaten down and crushed? Have you been asking why? Is there something I've done or need to do Lord? Have you been crying out how much longer? You're not alone! Many have been in a season of much preparation. The Lord has been strengthening us and preparing us for what's to come. Why the hard stuff? Because He loves us! He knows what we're made of.....but often we don't. The only way we can know that we can stay in faith is to have our faith tested to the limits! The tests bring testimony....and the testimony is for others to come to know Jesus! "He is jealous for me, Loves like a hurricane, I am a tree, Bending beneath the weight of His wind and mercy.When all of a sudden, I am unaware of these afflictions eclipsed by glory,And I realize just how beautiful You are,And how great Your affections are for me.And oh, how He loves us, oh,Oh, how He loves us,How He loves us all"
Imagine yourself as a tree....imagine the wind of a hurricane causing you to bend. The pressure from the 150mph plus winds would be a little intense, don't you think? But trees firmly planted with deep roots can withstand the winds. They may get a little battered and lose some leaves or even a branch or two, but the tree itself will stand. The same is true for us who are firmly planted and grounded in the Word of God. For those who have a real relationship with Jesus. The point of this blog to share with you the urgency of the hour we are in. 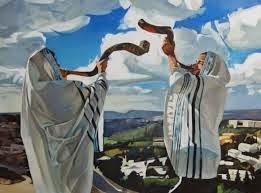 About a month ago, in my spirit, I heard the Lord say, two trumpets will blow this year. The first trumpet will be a warning call and the second trumpet will be a victory sound. I sensed He was saying they would coincide with the red blood moons. I want to insert here a couple of thoughts from my friend Frann Wohlers who is a Messianic Jew. She adds valuable insight into the significance of the seasons. "In regards to the 2 blood moons occurring in 2014, the first blood moon will be on Passover, 4/15/14, which is the first festival of the year on the Jewish sacred calendar. The second blood moon will be on 10/8/14 which is the first day of Sukkot (Feast of Tabernacles). Sukkot is the last festival of the year on the Jewish sacred calendar. Teshuvah, the 40 days of repentance falls in between these 2 blood moons and these 2 festivals. Teshuvah is observed each year as a time of deep repentance which culminates on Yom Kippur, the Day of Atonement. It is very signficant that the last blood moon of 2014 (10/8/14) falls almost immediately after the Day of Atonement, (10/4/14) when repentance has been completed and the books have been closed and sealed. The fact that the blood moons are falling on Jewish feast days is very significant. Even more significant is the fact that this same exact pattern repeats itself in 2015. There will be 2 blood moons in 2015; the first falls on Passover and the second falls on Sukkot. God is sending us powerful signs from the heavens to get our attention. And if all this weren't powerful enough, there's more. In between each of the blood moons during 2014 and 2015, there will be a solar eclipse. The solar eclipse of 2014 will be a partial eclipse, but the solar eclipse of 2015 will be a total eclipse. Lunar eclipses are portents for Israel, while solar eclipses are portents for the nations." About the same time a month ago, I was in a store here in El Dorado Springs, MO. There was a really cool wall hanging -a piece of wood painted to look like brick with the scripture above on it (Matt 7:25). The Lord said to me, buy that. I didn't really think I needed it, but did what I was told. 1. Observation: It was wood painted to look like a brick. Lesson: Our foundation MUST be on the Rock (JESUS). We have to be discerning and guarding our hearts. There are many false teachers, false doctrines out there. The only way to be wise and build on the Rock, is to be in the Word of God daily!!!! Test what you hear? Does it match the Word or is it contrary? Only believe and take in the TRUTH!!! 2. Observation: The Word of God is for those who have ears to hear. Are you listening?? Lesson: We must ask the Holy Spirit to help us hear what the Word is speaking to us. We can't just go through the motions but need to allow it to be living and active in our own lives. 3. Observation: The Word must be put into practice!!! Lesson: Are you a doer of the Word? Do you practice what you preach? Do you live out your faith in all you do or do you only talk about it? Be, breath, live, act, and do the Word of God everywhere you go. There is always someone who needs Jesus!!!! "The rains came, the streams rose, the winds blew and beat against that house"
coming upon us...... where is your foundation built? God in His mercy is giving us time to change our ways, to repent, to get our foundations strong or stronger. 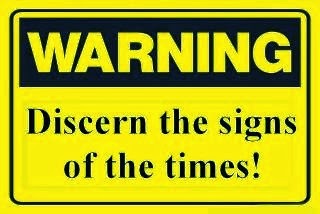 Will you hear and heed this warning? The choice is yours. God loves you and His desire is that none would perish. He wants you to come out victorious and to help others as well. We believe that the second trumpet might be..... a sign in your spirit that shows you have ears to hear... that your foundation has been tested and you will come out victorious. Praise God! Ken and I are doing good. We are excited about the plans the Lord is revealing to us about our purposes here in El Dorado.... just waiting on Him to bring things to pass and once we feel led to share with you more details, we will. Please keep us in prayer for His perfect timing and provision (of course, in our minds things need to happen before our lease up in July). We have had many opportunities to pray for different people and there are several that the Lord is having us invest much time, prayer and support for. It's been a real honor! This is still very much a part of who we are and what we do. We seek the Lord for who, where and how He wants us to minister and then we go do it! We continue to meet tons of godly people - doing fellowship, home group and other things with. We are so thankful for this and them! Yea God! We continue to pray and believe for my complete healing. It has been a bigger challenge with now 90+ nights of 2-4 hours a sleep. (I have had I think 3 nights only with 5 hours a sleep). We think related to my thyroid being so out of whack and working on getting that regulated again. Thank you to all of you who come visit us!! That too has been a major blessing!!! We welcome any and all who want to come. It's an easy drive. Please as you feel led, continue to pray -pray for strength as we endure slaying all the new big giants in our our "promised land here", pray for provision until God opens the door for our new purposes, and please continue to pray for my healing so that I can have energy, no pain and more freedom to minister.